I have a confession: I knocked back 320 pints at the pub last night. I actually only had two shots of a decent single malt but it took 320 pints of water to grow and process the grain used to make the whisky. That’s a whole lot of water considering the average bathtub holds 60 to 80 litres. Even after 20 years of covering environmental issues in two dozen countries I had no idea of the incredible amounts of water needed to grow food or make things. Now, after two years working on my book Your Water Footprint: the shocking facts about how much water we use to make everyday products, I’m still amazed that the t-shirt I’m wearing needed 3,000 litres to grow and process the cotton; or that 140 litres went into my morning cup of coffee. The rest of my breakfast swallowed 1,012 litres: small orange juice (200 litres); two slices of toast (112 litres); two strips of bacon (300 litres); and two eggs (400 litres). Researching all this I soon realised that we’re surrounded by a hidden world of water. Litres and litres of it are consumed by everything we eat, and everything we use and buy. Cars, furniture, books, dishes, TVs, highways, buildings, jewellery, toys and even electricity would not exist without water. It’s no exaggeration to say that water is far more valuable and useful than oil. A water footprint adds up the amount of water consumed to make, grow or produce something. I use the term consumed to make it clear that this is water that can no longer be used for anything else. 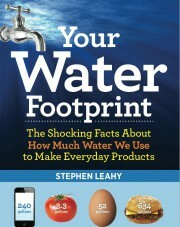 Often water can be cleaned or reused so those amounts of water are not included in the water footprints in the book. The water footprint of 500ml of bottled water is 5.5 litres: 0.5 for the water in the bottle and another five contaminated in the process of making the plastic bottle from oil. The five litres consumed in making the bottle are as real water as the 500ml you might drink but hardly anyone in business or government accounts for it. The incredible amounts of water documented in Your Water Footprint are based primarily on research done at the University of Twente in the Netherlands, where Arjen Hoekstra originated the concept of water footprints. The amount consumed to make something varies enormously depending on where the raw materials come from and how they are processed. Wheat grown in dry desert air of Morocco needs a lot more water than wheat grown in soggy Britain. For simplicity, the amounts in the book are global averages. One of the biggest surprises was learning how small direct use of water for drinking, cooking and showering is by comparison. 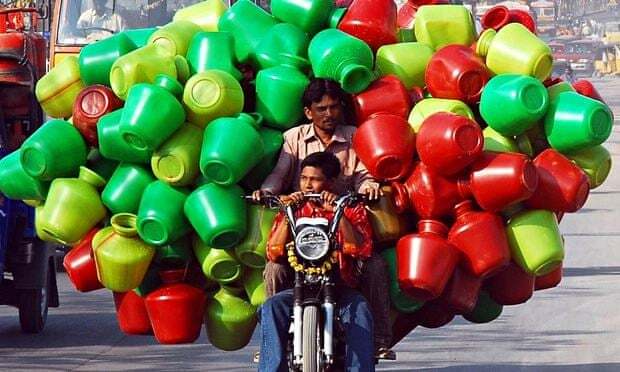 Each day the average North American uses 300 to 400 litres. (Flushing toilets is the biggest water daily use, not showers.) 400 litres is not a trivial amount; however, the virtual water that’s in the things we eat, wear and use each day averages 7,500 litres in North America, resulting in a daily water footprint of almost 8,000 litres. That’s more than twice the size of the global average. Think of running shoes side by side: the global shoe is a size 8; the North American a size 18. By contrast, the average water footprint of an individual living in China or India is size 6. Water scarcity is a reality in much of the world. About 1.2 billion people live in areas with chronic scarcity, while 2 billion are affected by shortages every year. And as the ongoing drought in California proves, water scarcity is an increasing reality for the US and Canada. Water experts estimate that by 2025 three in five people may be living with water shortages. While low-flow shower heads and toilets are great water savers, the water footprint concept can lead to even bigger reductions in water consumption. For example green fuels may not be so green from a water consumption perspective. Biodiesel made from soybeans has an enormous water footprint, averaging more than 11,000 litres per litre of biodiesel. And this doesn’t include the large amounts of water needed for processing. Why so much water? Green plants aren’t “energy-dense,” so it takes a lot of soy to make the fuel. Beef also has a big footprint, over 11,000 litres for a kilo. If a family of four served chicken instead of beef they’d reduce their water use by an astonishing 900,000 litres a year. That’s enough to fill an Olympic size pool to a depth of two feet. If this same family of opted for Meatless Mondays, they’d save another 400,000 litres. Now they could fill that pool halfway. We can do nearly everything using less water. It’s all about smart substitutions and changes, rather than sacrifice and self-denial, but we can’t make the right choices unless we begin to see and understand the invisible ways in which we rely on water. This entry was posted in climate change, energy, environment, food, global warming, pollution, Water and tagged beef, clothes, drought, electricity, Energy, Flood, food, hidden water, meat, shortages, virtual water, water footprint, water scarcity, water shortage by Stephen. Bookmark the permalink.